This Fall, HB hosts a series of three public talks. Join us for a conversation! 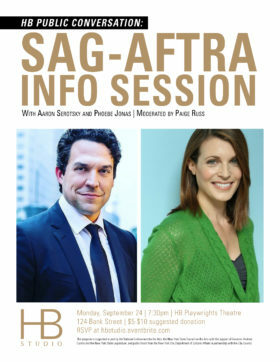 Have questions about SAG-AFTRA? Join us for a conversation with SAG-AFTRA representatives and leading commercial performers about the benefits of the union and taking the next step in your career. Learn what it takes to navigate today’s changing media landscape and what SAG-AFTRA is doing to stay ahead of the curve. In 2015, The Mother Line Story Project began by building a collective – story by story. It started with an idea to lead women through writing workshops, encouraging them to create short monologues in the voices of their female ancestors. (Think – The Moth meets ancestry.com.) Before long, they had women of all ages & ethnicities performing for diverse audiences Off-Broadway – these previously untold stories were in turns hysterical, heartbreaking, poignant, & slice-of-life. The Mother Line Story Project collaborates with female-identifying performers, designers, directors, activists, students, businesses & communities, presenting these stories all over the world. 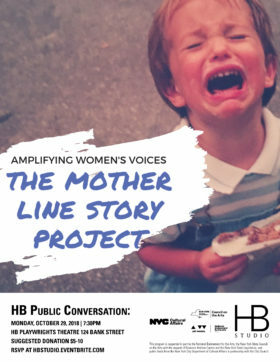 Fostering connection & providing a safe artistic space for female expression are their proudest accomplishments.Join us for a conversation about The Mother Line Story Project with Founder/Executive Director Eliza Simpson and President/Director of Education and Development Lauren Nordvig. Also featuring the performance of a Mother Line story. 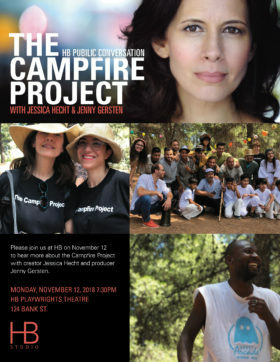 Please join us at HB on November 12 to hear more about The Campfire Project with creator Jessica Hecht and producer Jenny Gersten.